Fehi formed northwest of New Caledonia on January 28, 2018 at 0000Z (Jan. 27 at 7 p.m. EST). The GPM core observatory satellite passed over Tropical Cyclone Fehi on January 28, 2018 at 3:42 a.m. EST (0842 UTC). The tropical cyclone had winds of about 35 knots (40 mph) when the GPM satellite passed above. Fehi intensified to have peak sustained wind speeds of about 50 knots (58 mph) and still had winds of tropical storm intensity as it moved by to the west of New Caledonia. 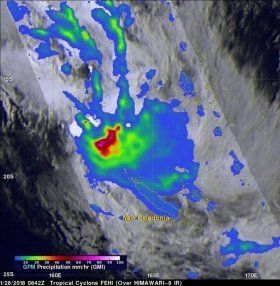 Data collected by the GPM satellite's Microwave Imager (GMI) showed that powerful storms northwest of New Caledonia were dropping rain at a rate of greater than 77 mm (3 inches) per hour. GMI also showed that Fehi was producing rain over a large area of the ocean extending from west of New Caledonia to the Loyalty Islands. GPM is a joint mission between NASA and the Japanese space agency JAXA.